That the Women of the Wall’s (WoW) monthly visits to the Western Wall provoke insults, spitting and sometimes worse from a group of haredim at the Western Wall is old news. But there was another story last Friday that the media either missed or botched entirely: the thousands of Jewish women and girls who filled the area directly in front of the Kotel and almost to the back wall of the Kotel plaza, completely dwarfing the group of 100 or so women associated with WoW. (The figure of 400 to 500 WoW members given by some outlets is patent nonsense.) When I arrived at the Kotel a little past 7 a.m., there were about 25 (not 2,000 as reported by Haaretz) young haredi men standing on the upper level at the far north of the Kotel Plaza shouting and ruining the prayers for all those on the men’s side who had come to pray on Rosh Hodesh. (I had already heard on the radio that police had arrested one haredi man.) What surprised me, however, was that the most prominent video camera remained exclusively focused on this small group among the many thousands then at the Kotel. The media showed absolutely no interest in the thousands upon thousands of seminary girls and older women praying on the women’s side and not raising their voices above a quiet whisper. Yet that sight brought tears to my admittedly biased eyes. There is a special purity about seminary girls found no place else in the world today. And this group was special in another respect: It included women and girls across the national religious-haredi spectrum. The leading rabbis of the national religious world had publicly given their support for the national religious seminaries to participate as well. The Kotel thus united the leading rabbis of both the national religious and haredi world. Somehow the media managed to mangle the presence of the thousands of girls, lumping them together with the male hooligans – often in a single sentence (as in this paper’s front-page story on Sunday) – as part of a single haredi protest. Yet Rabbi Aharon Leib Steinman had explicitly conditioned his permission for seminary girls’ attendance on there being absolutely no violence. Yosi Deutsch, a haredi member of the Jerusalem Municipality, lamented in a radio interview that the boys at the Kotel were ruining the message, which was to juxtapose traditional women’s prayer with the attention-seeking of WoW. THAT MESSAGE was formulated by two friends living in the settlement of Kochav Ya’acov – Ronit Peskin and Leah Aharoni. Over the three weeks leading up to Rosh Hodesh Sivan, they created Women for the Wall, employed their considerable skills in social media to publicize their initiative, were interviewed dozens of times by both the local and international media, and took on the WoW agenda in numerous blogs at the Times of Israel. But for their initiative, there would have been no organized women’s prayer gathering last Friday morning. They are true heirs of Sarah Schenirer, the divorced Cracow seamstress who founded the Bais Yaakov movement, the most influential movement in the haredi world in the 20th century. Without the approval of the Hafetz Haim and the Gerrer Rebbe, the Bais Yaakov movement would never have grown as it did. But without Sarah Schenirer it would never have come into existence, and she led the movement. Neither Peskin nor Aharoni is mainstream haredi. Peskin, 25, home-schools her three young children, teaches women how to forage for edible food growing wild, and runs a website called Penniless Parenting, on how to keep down the family food budget, which receives 60,000 to 70,000 hits worldwide a month. 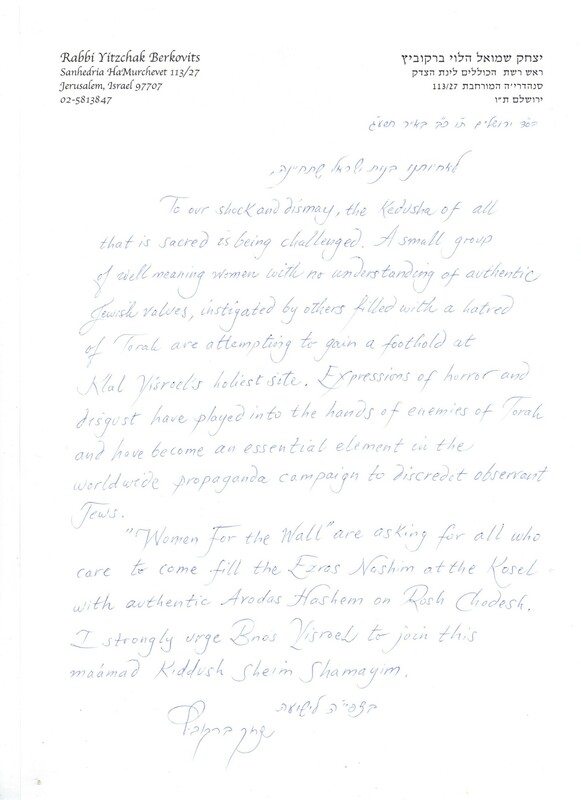 In response to the boast of WoW founder Susan Aranoff that WoW seeks to liberate haredi women so that they can “function religiously… without the help of men,” Peskin describes her religious journey from her modern Orthodox upbringing in Cleveland to “quasi-haredi,” including a rebellious teenage period of no observance in between. Her religious search forced her to become financially independent at 17. Of her current life, she writes, “It was a path I chose, and fought lots of obstacles to get there. I don’t live this way because I haven’t witnessed alternatives. I’ve witnessed them and rejected them, and made the choice to live as I do because I find it the most meaningful type of life for me. She, too, traveled a long religious path from her native Soviet Union – a path that started in a Reform temple and included a period in the congregation of Rabbi Avi Weiss, a leading figure in Orthodox feminism. “There is nothing more demeaning to women than positioning the male experience as the only one worth living and setting up women for an ongoing game of catch-up,” she says. “I have liberated myself from the need to predicate my identity on becoming ‘one of the boys.’” Peskin points out that WoW’s mission statement does not mention God once. WoW supporters speak of the Kotel as a wedge issue for liberal Judaism in Israel (Rabbi Eliana Yolkut in Haaretz); tell the BBC that Israel is no “Club Med for the Jewish soul”; convince non-Orthodox Jews that they are hated in Israel and not allowed to worship freely, even though they can pray as they want, almost any place they want, including just south on the Western Wall at Robinson’s Arch, as Conservative and Reform groups already do; and call for the Kotel to be declared a national monument, as well as for the mehitza to be removed between 9 a.m and 3 p.m. and men barred (Anat Hoffman in the St. Petersburg Sun-Sentinel). The omission of God is no surprise. For Hoffman, the self-styled Rosa Parks of WoW, the Kotel has no sanctity and the return of the Temple and its “sacrificial cult” is a repugnant thought. The Kotel is just the best place to attract attention. They know that marriage does not thrive in a glass house, and service of God is not for TV cameras. 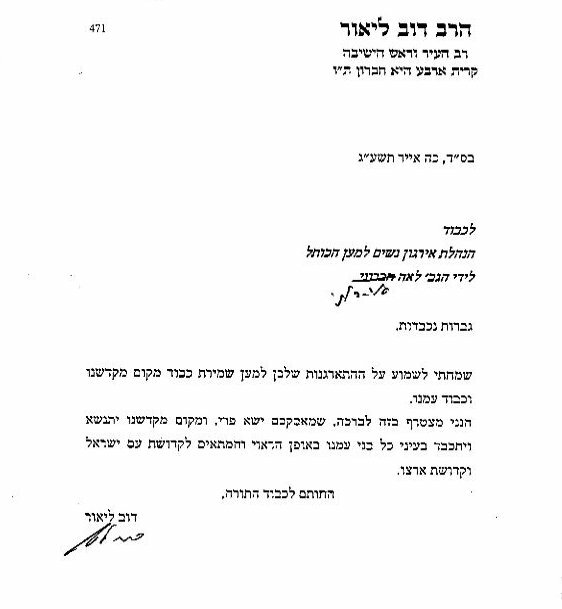 In a post after Rosh Hodesh, entitled “Why Guys Are Thugs…” Peskin speculated that those who attacked WoW suffer from low self-esteem. To compensate, they need attention and an illusion of control. In that, at least, the haredi thugs and the Women of the Wall have something in common.